AirVPN was born back in 2010 when a group of activists, hacktivists and privacy lawyers joined forces after meeting at a Pirate Party festival in Rome. The pro-privacy group of international activists started AirVPN as a free service at first, but needed to grow commercially to remain sustainable. They have now grown a network of more than 300 high bandwidth servers across 16 countries, all managed and controlled in-house by Air. There we’re a few subtle but very important security layer features offered with AirVPN that we really like. Anyone can have access to server monitoring on the web to verify and ensure that they keep their promise to never overload their servers and retain the minimum stated bandwidth allocations. AirVPN offers 3 simultaneous connections on all plans and offers packages that range in subscription time. You can try the service for 3 days by signing up to their €1 trial but it is said that they will often provide it for free if you request a trial by email. One month, three, six and twelve month packages are offered, without any restrictions, extra add-ons or paid options to be bothered with. 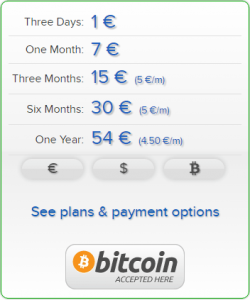 Payments by BitCoin are also accepted. The Tier-1 backbone network operates data centers across 30+ locations in 16 countries and ensures good speeds across hundreds of servers. All connection protocols can be used but OpenVPN is highly suggested over other less secure options, especially PPTP. Port forwarding and DDNS for optimization of P2P file transfer speeds works wonderfully, and all P2P usage is welcomed. The minimum allocated bandwidth for all connections is 4Mbits/s down and up, but this only happens when a server is at high capacity. Full monitoring of the AirVPN server list is provided. 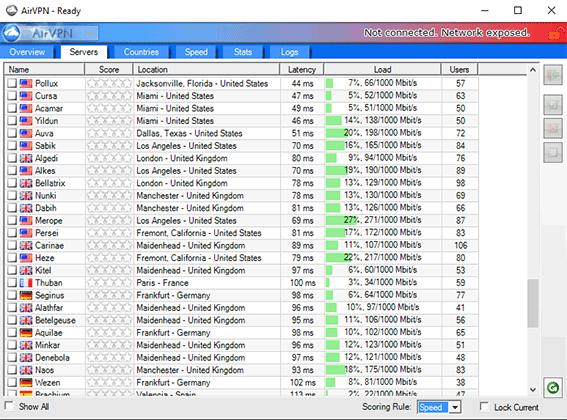 You can view detailed latency and server load stats to quickly select an optimal connection point. This detailed approach at sharing real-time network health shows a good level of transparency from AirVPN, an attempt to demonstrate and exercise their commitment to solid and dependable service. Additionally, the website also provides users with a tool that can route a specific address and ports to find the servers with the shortest and quickest routes available. This ‘Checking routes’ tool eliminates the guesswork in finding servers for specific uses by providing ping and resolution times for each server. AirVPN adds a layer of security for your IP privacy by providing a different login and logout IP address. The shared IP assigned to you when you first connect, changes when you disconnect so no correlation can be made with connected IPs. This very subtle detail is really valued, as high security is dependent on layering of different security methods and processes. Custom client apps are available for Windows, Linux and Mac OSX, while mobile Android and iOS users are directed to download OpenVPN along with their automatic configuration file. This is not a bad thing, since OpenVPN gives all the functionality needed, and is usually the basis for all VPN clients ever made. 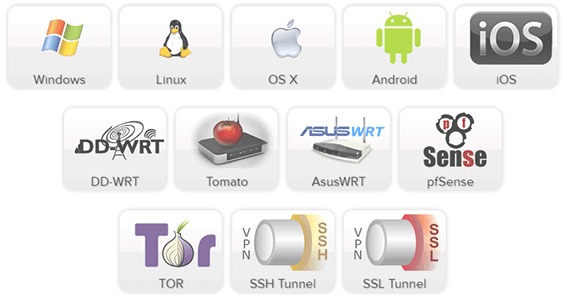 Alternative setups include OpenVPN on all available platforms, TunnelBlick for Mac OS. They also provide tutorials and config generators for network routers from DD-WRT to pfSense, as well as Tor and SSH, SSL tunneling options. Overall, they provide good flexibility, giving the option to use their own clients on desktop platforms, while still providing automatic configuration files for alternative options. This may be popular for advanced users that prefer to use OpenVPN over proprietary software. Dynamic Port Forwarding is used to increase P2P transfer speeds and quickly get around port restrictions placed by your ISP. It is debatable if this feature is really needed as many torrent clients now feature similar functions, but it’s not a negative to have it available. A very strong no privacy log service policy is claimed by AirVPN. With the dynamic IP swaps from login to logout, and Perfect Forward Secrecy key exchange that effectively re-initiates your encryption key negotiation every 60 minutes, you get a multi-layered service of protection with AirVPN. 4096 bit RSA keys are using with AES-256-CBC channels on OpenVPN. In order to retain as much control over the security of the data travelling across their servers, the company chose to keep growth to a minimum, only expanding to new locations when necessary. Over the last couple of years, I have only seen one or two new countries added to their list. As long as you don’t need more coverage than what is offered, this should be a plus. AirVPN follows European Union directives that effectively protect free speech and privacy; Directive on Data Protection and Directive on the processing of personal data and the protection of privacy. Being that AirVPN is concentrated in Europe, this is a great option for all of the EU. All servers outside of Europe follow a minimum of equivalent or higher privacy measures. We did not have much to complain about for speed, the minimum 4Mbits/s was never experienced, and with their high detailed server list we could easily steer clear of busy servers and attain almost no loss on bandwidth speeds on P2P and streaming. The high level of encryption did affect speed somewhat, but not enough to cause issues. Unlimited usage is offered on all servers and although small, the quality of the tier-1 backbone infrastructure provides respectable speeds and reliability. Over the years of revising my service review, they have added hundreds of servers to upkeep with demand and user base growth. I’m satisfied with the amount of low load servers available in any given key location. In summary, a good service on speed and capacity. One you sign-up for AirVPN, they have an easy quick download and setup software client for all platforms and easy to follow guides to get going. Contacting AirVPN was easy and the response time was fast. Service went well so we did not need any technical support. General feedback from customer reviews seem to be mostly on the positive end. The team is dedicated to the cause of privacy, net neutrality and data protection, and treat their customers with the same passion. 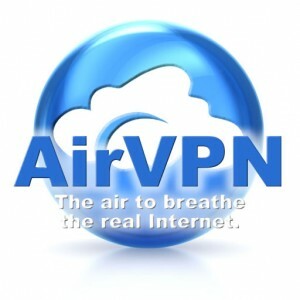 Overall, AirVPN is one of the better European based VPN services we have reviewed. The service works well and has improved considerably over the course of the last two years when I originally reviewed it. The company built a strong foundation around net neutrality, security and privacy, arguably making them trustworthy of handling your encrypted traffic. We commend them on the work they have started back in 2010 and exemplifying the minimum required protocols necessary with DNS resolution protections and other extra layers offered by AirVPN, to truly be called a secure VPN service. Although a smaller network, server count has grown considerably to handle the masses, all while retaining a smaller but securely controlled list of key countries for a useful overall global service coverage. Visit their website to get more info pertaining to their service and security features. Direct route testing and live server monitoring. 3-Day trial package or 3-Day/5gig Limit refund period. No custom mobile apps – Android, iOS uses OpenVPN. Smaller network coverage, but stronger control & security. Good app and helpful …. Been using for years, never had a complaint yet. I use it from command-line level from my 4G hotspot/router running DD-WRT (allows me to have full control). This is pretty much the more privacy/secure VPN* you can get as for my own internal research shows its pretty much a dead-end for discovery or warrant canaries. If you don’t know why its important to have a NO LOG VPN or how to use a VPN properly, perhaps you should stay on facebook kiddies. *Airvpn really does not discriminate on protocols except for spamming, and even then, really they have no way to enforce being the nature of the setup if implemented properly.